Office File Storage Equipment...learn about all the options in one place! Your Choices in Office File Storage Equipment go way beyond File Cabinets! If you have files or plan on having files in the future, storing those files in a neat efficient manner is likely a priority. 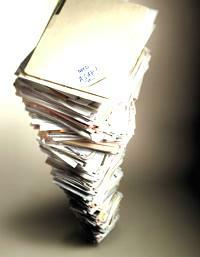 After all, how high can you stack a pile of folders on your desk or the floor before they fall over?? I have been to more than a few offices, especially in the Legal and Educational professions that have expanded my reality for how high you can stack file folders!! 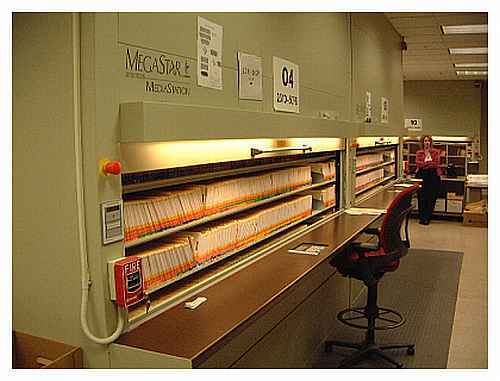 Of course it is inevitable that the file folder you will need, is always on the bottom of the stack, when you use this method of filing! So as a result, most offices choose to move beyond the stacking method which forces them to choose some type of office file storage equipment. If you are starting from scratch or want to start from scratch, now would be a good time to look at the setting up a filing system page for other questions that need to be asked or considered before you select the office file storage equipment that is best. You won’t be surprised to hear that the most widely used piece of equipment for office file storage is the file cabinet. But what might surprise you is the File Cabinet is also one of the most expensive ways to store files on a cost per Linear Filing Inch basis. So why do so many people use the file cabinet? Here are a few of the most popular answers I hear everyday when I ask the question. "We didn’t know there were any other options." "We have always filed this way." "We only started with a couple file cabinets but they multiplied." Now I am not saying you should immediately scrap all of your old file cabinets in favor of an alternate piece of office file storage equipment. 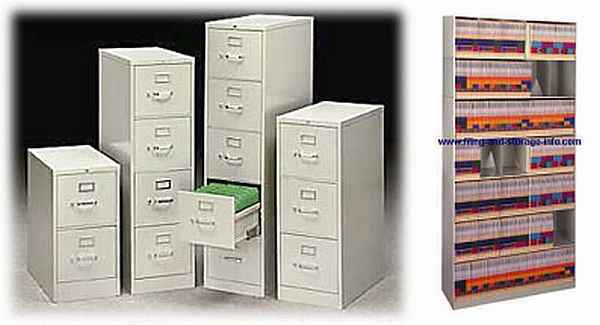 There are many applications where file cabinets are the best solution for office file storage. But what I am saying is you should come to that conclusion through analysis of your needs! So what other options are available for office file storage equipment beyond the file cabinet? To understand the other options you need to understand the difference between the drawer filing method and the shelf filing method of file storage. Go to the Drawer Filing vs. Shelf Filing page. If you understand the difference already explore to the different office file storage equipment options for both drawer filing and shelf filing listed below. The Vertical File Cabinet. This is the old style cabinet that has been around for over 130 years. Files are stored front to back in these cabinets. They come in a variety of heights from 1 to 5 drawers a variety of depths and typically letter or legal width. The Lateral File Cabinet. 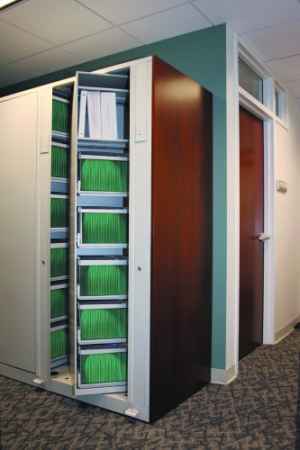 Lateral file cabinets are less deep than vertical file cabinets but much wider. Files are stored side to side or in some cases front to back with multiple rows in the drawer. These cabinets come in a variety of heights from 2 to 5 drawers high and will hold letter or legal size files in the same cabinet. They are aesthetically more pleasing than vertical cabinets, but less space efficient in letter size filing applications than vertical cabinets. The Rotary Cabinet with Pullout Drawers. Rotary cabinets are like having two lateral file cabinets back to back on a lazy Susan. Configured with pullout drawers up to 5 levels high (shelves area also an option). The user turns the cabinet on its axis to reach files stored on either side. What makes the Rotary Cabinet unique is all the files can be accessed from one aisle in front of the unit, versus having file cabinets back to back with an aisle for access on both sides of the unit. The Vertical Carousel with Pullout Drawers. Vertical carousels are automated file cabinets the revolve like a Ferris Wheel bringing the drawer to the operator at the perfect height for easy access (no bending or reaching as is the case with other options). This unique product can be anywhere from 7’ to 30’ tall making it the only drawer style cabinet that can utilize all of the vertical space in the room. 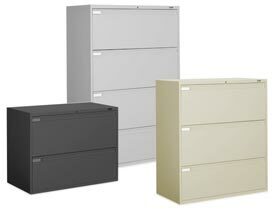 A motor rotates the unit making it the only 100% ADA compliant file cabinet in the world. Just press the button and the drawer comes to you at the perfect height for someone standing, sitting or even in a wheelchair. File Shelving. Files are stored horizontally on shelves inside of fixed shelving units anywhere from 2 shelves to 8 shelves high in most office environments, though it is possible to go much higher with the use of rolling ladders. Static file shelving also comes in various widths and depths, single faced or double faced. The most common variety of static shelving is 4-post, also known as Aurora Shelving. 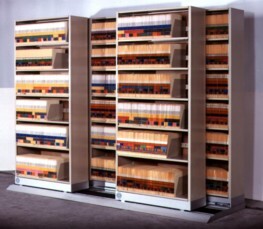 L&T Shelving, Record Master shelving or Quik-Lok shelving. Other types of static file shelving include Stackable Shelving, Cantilever Shelving and Case Style Shelving. 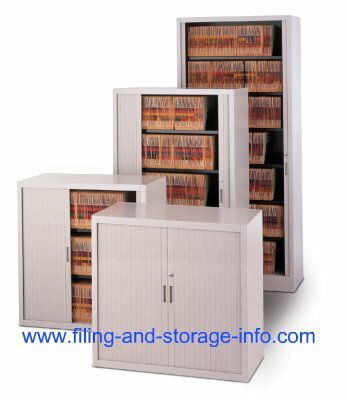 Enclosed File Shelving. 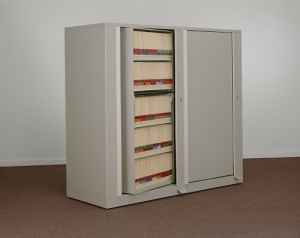 With all the space benefits of open file shelving, enclosed file shelving cabinets come with locking doors. There are a variety of styles of doors that can be used, ranging from individual flipper doors, to hinged doors, to sliding doors and even tambour doors. Doors are added in situations where security or aesthetics require the contents of the cabinet to be out of view or secure. The Rotary Cabinet for Shelf Filing. Rotary cabinets configured for shelf filing are like having two sections of shelving back to back on a lazy Susan. They can be configured up to 8 levels high (pullout drawers are also an option). The user turns the cabinet on its axis to reach files stored on either side. What makes the Rotary Cabinet unique is all the files can be accessed from one aisle in front of the unit, versus double faced static file shelving which requires access from aisles on both sides of the unit. The Side by Side System. 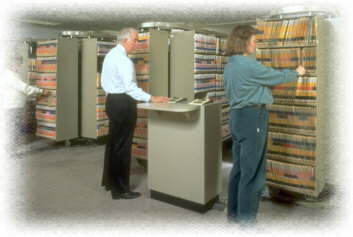 Side by side systems also known as Bi-Files or Tri-Files add a sliding shelving unit in front of fixed shelving units. The sliding unit is attached to a track in front of the fixed units, there is one less unit in the front, to provide access to the back fixed units. Side by side units come in various heights, widths and depths and can be constructed up to 4 units deep. The High Density Mobile Shelving System. High density mobile shelving goes beyond traditional static shelving by placing the static shelving on carriages that roll on track installed on the floor. Having shelving on carriages eliminates the need for a fixed aisles in between each section of shelving. Now it is possible to have one aisle and to move that aisle wherever it is needed at any time by the user. The result is a storage system which can hold the same capacity as static shelving in half the floor space or a storage system which will hold twice the amount of storage as static shelving in the same floor space. There are three styles of mobile shelving, manual operation, mechanical assist operation and electric operation. The Vertical Carousel for Shelf Filing. Identical to the Vertical Carousel describe above in function, the carousel can also be fitted with shelves to accommodate side tab file folders. A motor rotates the unit making it the only 100% ADA compliant file cabinet in the world. Just press the button and the shelf comes to you at the perfect height for someone standing, sitting or even in a wheelchair. The Horizontal Carousel. Horizontal Carousels are also automated pieces of equipment. These carousels revolve around like a merry-go-round bringing the desired shelf to the user when they press a button. Horizontal Carousels come in various heights and can accommodate a variety of file sizes, binders or other media. After reading this page and the individual product pages you will be better educated than 99.5% of office planning professionals on what options exist in the marketplace for file storage equipment. This education will give you the knowledge to understand what vendors are offering and which product will best meet your needs. If you want some help with your project or competitive pricing, contact me today for assistance. If I can't help you directly I will try to introduce you to someone that can. Copyright 2008-2017. Filiing-and-Storage-Info.com All rights reserved.